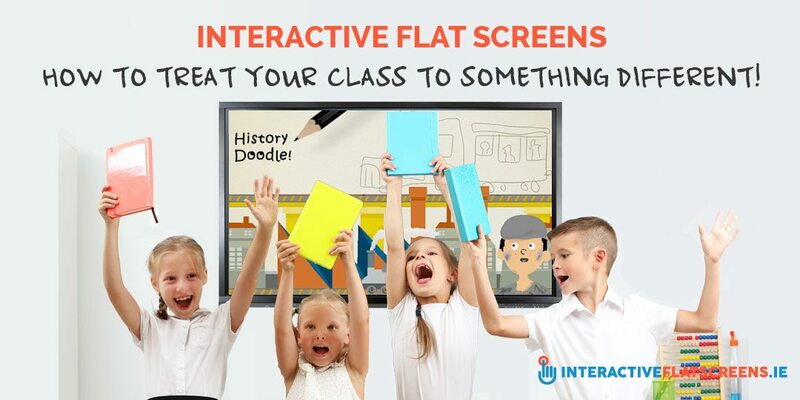 Interactive Flat Screens: Treat Your Class to Something Different! Interactive Flat Screens: How to Treat Your Class to Something Different! Interactive flat screens use the same LED technology that regular flat screen TVs use. The interactive flat screen also looks exactly like a large TV screen and the quality of the images is just as good. So what better way to attract your pupils’ attention and interest than to introduce a flat screen to the classroom? It is so much more impressive than traditional whiteboards or interactive whiteboards. For today’s IT savvy pupil, it will be the coolest thing in the classroom. As the replacement of the traditional whiteboard, one of the main instructional tools in the classroom environment, that’s really saying something! Some would say that the interactive flat screen is a novelty that wears off in time but there is so much you can do with them that your pupils will probably never become bored with it. An Interactive Flat Screen Treat! Because of its similarity to a TV screen, pupils will immediately associate it with recreation and pleasure. Some might argue that this is inappropriate and that to satisfy such expectations by playing a film on the flat screen is a distraction from learning. But every class, especially at primary and secondary level, deserves a treat now and then and playing a DVD by connecting your laptop or DVD player to the flat screen is one way of providing it. Gone are the days when a TV and VHS player were wheeled into the classroom and all the blinds were drawn. 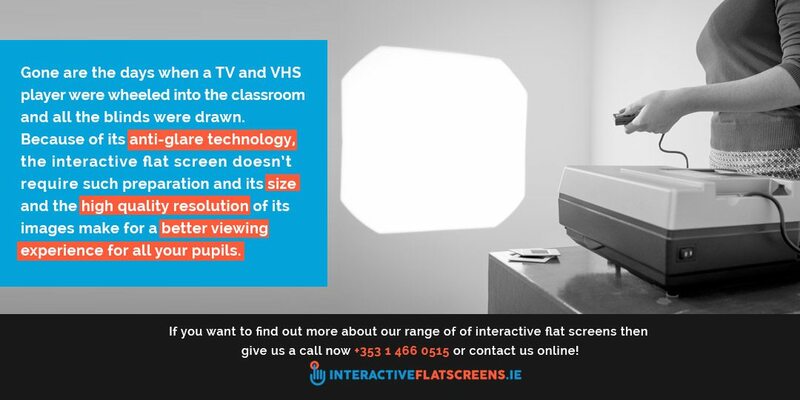 Because of its anti-glare technology, the interactive flat screen doesn’t require such preparation and its size and the high quality resolution of its images make for a better viewing experience for all your pupils. Also, it doesn’t have to be completely for recreation and pleasure. The film might have content that is relevant to what the class is studying in a certain subject. It might be about a certain period of history or an adaptation of a work of literature. Another treat you can give to your pupils through the interactive flat screen is music. It can be just for fun. Or it can be a background to learning: a way to create a certain ambience. Or it can be the object of the lesson itself. Music stirs the imagination and touches the soul. The power of music should be learned by all pupils, ideally at primary level before they start to listen to their own music regularly. By simply getting them to close their eyes and listen this can be done. Classical music is probably the best option for this. Play a CD on your laptop or download from iTunes. If you want better sound quality, for both films and music, most interactive flat screens can be connected to external speakers. It is a unique feature of the interactive flat screen that it can both educate and entertain. This will make it the most powerful technology in the classroom of the future. Your pupils will never get bored of it, especially if you treat them to some fun and relaxation or just something different every now and then. If you want to be remembered well by your pupils and get the most out of the flat screen, don’t be afraid to press the play button. 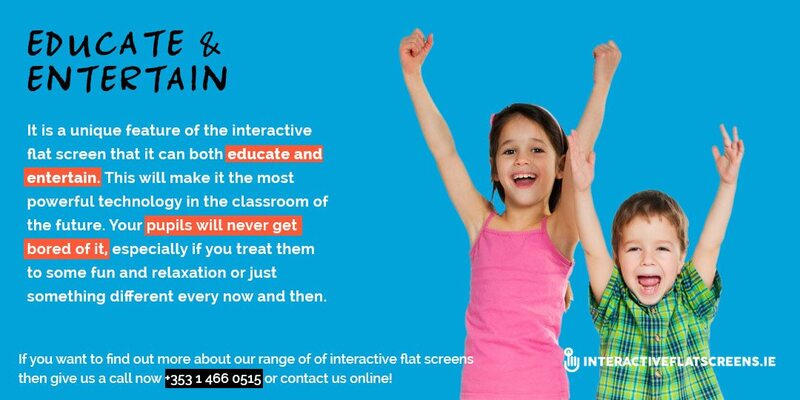 If you want to find out more about our CleverTouch range of interactive flat screens then give us a call now +353 1 466 0515 or contact us online!